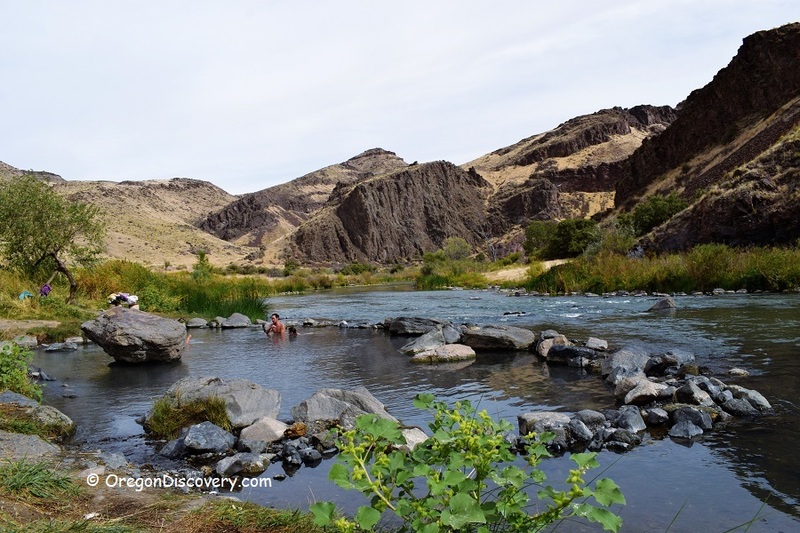 Snively Hot Springs is an excellent destination to enjoy natural soaking on the bank of the Owyhee River that flows through multi-colored walls of the Owyhee River Canyon. This spot has gained the great attention because of the fantastic views from the pools and close proximity to a highway. 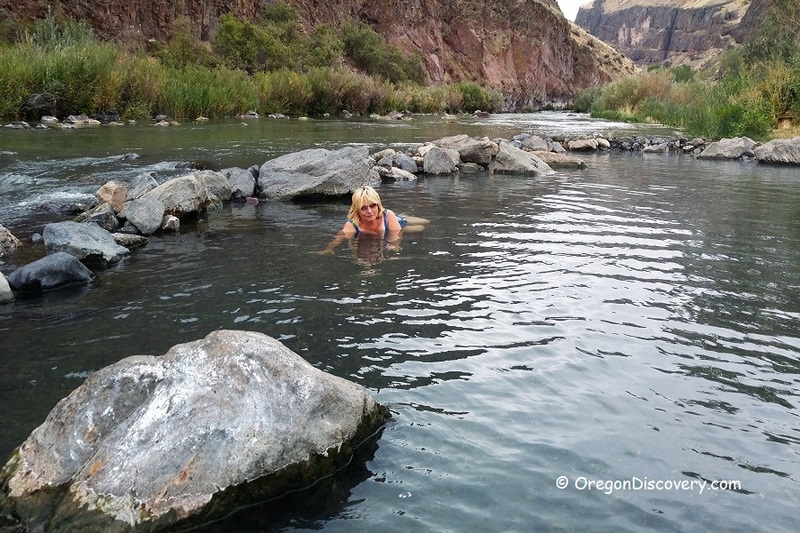 Located about 19 miles southwest of Nyssa along the Owyhee River, Snively Hot Springs can be termed as semi-primitive, but in a way that makes your outdoor adventure refining and exclusively civilized. 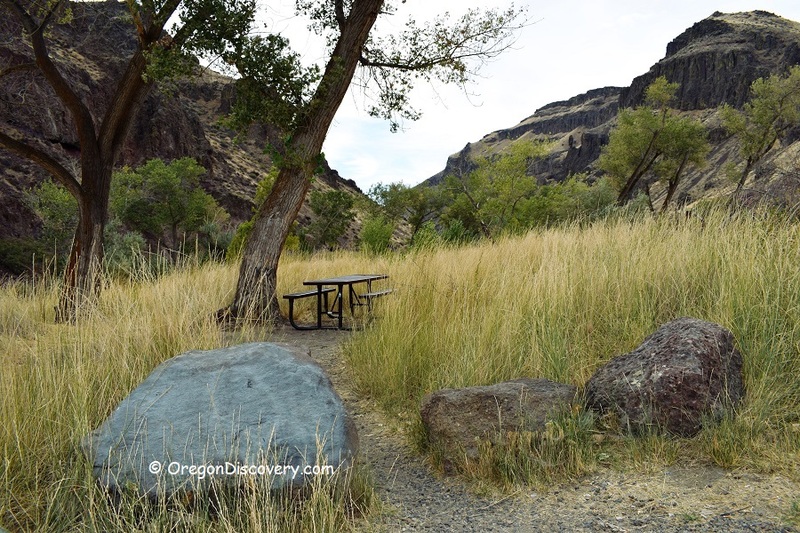 Driving through the labyrinth of the majestic Owyhee Canyon to Snively Hot Springs is itself a wonderful experience, as you navigate through a maze of roads that are not yet in the main grid, transverse through highway 201, take the Owyhee Avenue and finally turn onto, zigzagging along the river, Owyhee Lake Road. A little more than one mile before Snively Hot Springs, you will see the huge pipeline transferring waters of Deer Butte Hot Springs from the source in the mountains to the small pond located on the other side of the road. The springs are readily accessible throughout the year, although the pools may submerge during the spring runoff leading to temporary closure, particularly in the high trout fishing season. Just before and after the spring, Snively provides a matrix of lush colors from the horizon, extremely comfortable temperatures, and the main course of a hot mineral water therapy. The extremely hot water of the thermal springs emerges out of the ground 300 feet from the river. The hot water flows down through a ditch to the manually built pool and mixes with the cold river water. The temperatures may vary from cold to very hot depending on your location in the pool. You can find the perfect temperature for soaking by moving towards or farther away from the source. The pool with the gravel bottom is approximately 20 feet in diameter and 2-3 feet deep. Due to the recreation area is overused and abused, BLM has closed the area from dusk until dawn, no glass containers within 30 feet, no camping and fires are allowed. 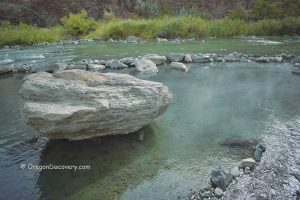 Most of the experts and reviewers of hot springs in Oregon have progressively given to Snively Hot Springs the highest rate because beneath the outward appearance of economic underdevelopment, is the very essence of an unforgettable hot spring, and one whose experiences are indeed, irreplaceable. Caution. Watch poison ivy along the river bank and around the parking area. Turn left and continue on Owyhee Lake Rd 6.5 miles to the destination on the left. Brown D.E., et al. "Preliminary Geology And Geothermal Resource Potential of the Western Snake River Plain Oregon". State of Oregon Department of Geology and Mineral Industries. 1980. 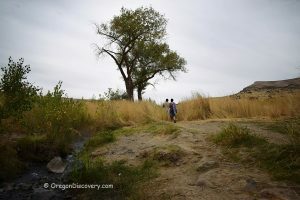 With the river being so high,are the hot springs flooded? The hot springs and river can be submerged when the river level is high, usually late in Spring.